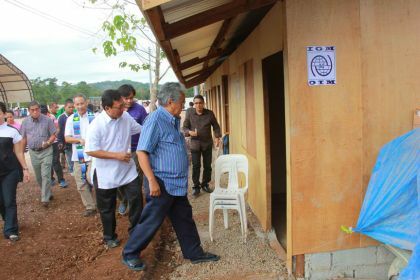 OZAMIZ CITY, Misamis Occidental, Jan. 31 (PIA) -- A total of P1.04 billion in damages to 28 public school buildings have been recorded in region 10 due to tropical storm Sendong last year. Eight of these school buildings with damages amounting to P261.10M were in the First Congressional District of Cagayan de Oro (CDO) while six others amounting to P556.85M were in the 2nd District of the city. Likewise, 14 of these school buildings with damages amounting to P222.33M were in the 2nd Congresional District of Lanao del Norte. CDO District 1 - Balulang Elementary School (ES), P4.2 million; Consolacion ES, P4.35 million; Canitoan ES, P2.4 million; Iponan ES, P2.85 million; Macanhan ES, P3.3 million; Pagatpat ES, P1.8 million; Bonbon ES, P2.55 million; and North City Central School, P4.65 million. CDO District 2 - Cagayan de Oro National High School (NHS), Balulang Annex, P800,000; Iponan NHS, P2.4 million; Bulua NHS, P6.0 million; Carmen NHS, P5.4 million; Angeles Sister NHS in Consolacion, P2.25 million. Although the Bonbon NHS also suffered the same condition, no amount of damage have been reported, as of press time. In Lanao del Norte District 2, the following nature and amount of damage were noted: Totally washed out - Bayug ES, P10.20 million; and Mandulog ES, P5.77 million. Severely damaged - Iligan City East High School (ICEHS), Hinaplanon Annex, P1.392 million; ICEHS Santiago Annex, P1.886 million; Bagong Silang ES, P1.374 million; Cabili Village ES, P3.006 million; Tu NHS, Digkilaan Annex, P695,000; Iligan City East Central School, P2.962 million; and Northeast II B Central School, P1.13 million.